We can place various types and size stickers and labels on your mail piece. Here are some of the common uses of this service. Turnaround time shown in the price calculator on the right is additional time needed in addition to the time required for your letter production. 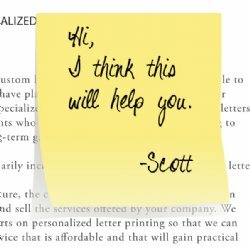 3"x3" Post-it Notes (RPN): These repositionable Post-it Notes are a great tool to add a personalized touch to your mail piece. 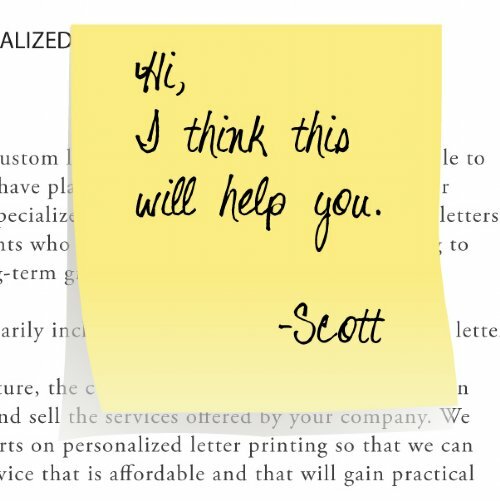 These Post-it Notes are USPS approved and are strong enough to even be placed on the outside of an envelope or a postcard. 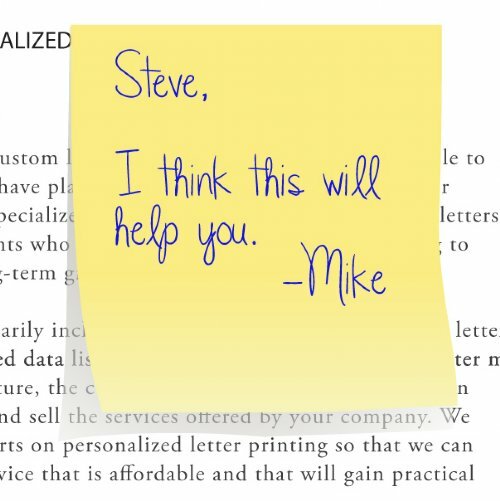 They can have a generic (non-changing) message printed on them; or even for a more personal touch we can print unique messages on each Posit-it Note, such as addressing the recipient by his/her first name. 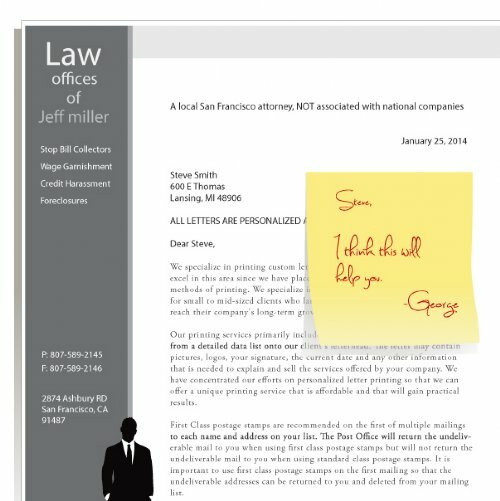 1"x1" white stickers: Your pre-printed mail pieces (e.g. postcards) have a postage indica that is no longer valid. You need to cover the old one and reprint the new indicia in the place of the old one. Various size address labels: You material is super glossy or UV coated and can not be addressed. 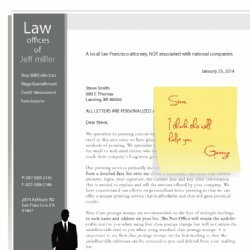 The background area of where the address needs to be printed is too dark to print addresses on. Your material has an address or a barcode which is incorrect and needs to be covered up and be re-addressed. All the above examples will require a white address label to cover the old information and have the new information printed on it. 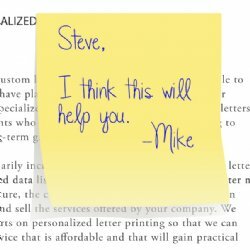 Place self stick address labels:Â Using self stick return address labels on your envelopes will create a very personal appearance that does not resemble junk mail and will get the recipient's attention. This is used in place of printing a return address on your envelopes. We recommend using gold color labels on white envelopes and silver or white labels on non-white envelopes; this will insure higher visibility. Click here for more information. The piece being labeled needs to meet the following requirements.